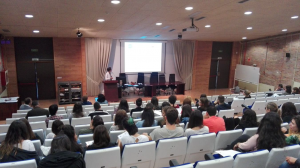 The first Multiplier Event organised by Stowarzyszenie Angielski w Medycynie (English in Medical Practice Association) was held at the Faculty of Translation and Interpretation at Vigo University on the 15th September 2016. There was a group of students and professors from the Department of English who specialize in translation and interpretation of English for Specific Purposes texts; including English for Medical Purposes. 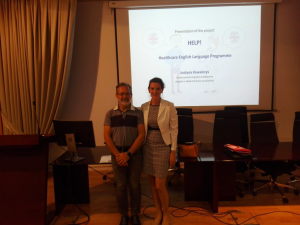 After the welcome speech of Professor Alberto Álvarez Lugris (read his comment on the event here) the event was opened and the voice was passed to Ms. Justyna Kowalczys, the HELP coordinator within English in Medical Practice Association. Ms. Kowalczys expressed her gratitude for the meeting and gave special acknowledgements to a high number of attendees. At the same time all the participants were handed in the HELP leaflets (in English and Spanish) and project business cards. 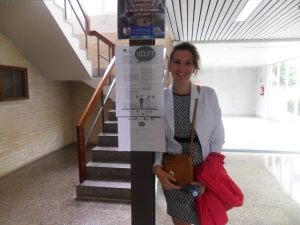 It is crucial to mention that the event gained publicity a few days before it by using university’s facebook page and showing HELP posters at Vigo university venue. Firstly, Ms. Kowalczys presented some practical tips about how to contribute from Erasmus+ possibilities to the audience. Some students already mentioned their mobility experience and one teacher talked about her work on EU funded project. Secondly, the HELP project was introduced. Its main idea and objectives were discussed. The audience was very much interested in the project’s final results (printed materials, moodle platform and app). 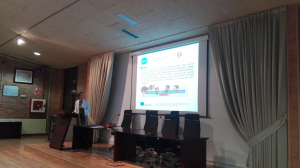 Consequently, the project consortium was presented together with their respective organizations. In the third place, Ms. Kowalczys concentrated on the main part of the multiplier event – presentation of the results of the finished project Output 1 – Analysis of Needs. The procedure of survey gathering was mentioned, as well as the targeted groups. Then, the conclusions compiled in “O1 Overall Report” prepared by the Slovak partner were discussed. Some crucial data and final graphs were demonstrated in order to share an overview on language experience, methodology applied, intercultural approach, topics selection, media used. This part deeply engaged the audience; the participants were eager to share their opinion on interculturality, the Internet used for studying foreign languages (moodle platform included) and language experience from abroad. listening exercises with velocity options, video clips and intercultural films reused from the EIW project. The audience was presented one video clip (Video Clip 1 from Module 9) and one intercultural film (“Jafar” from Module 15). Subsequently the discussion was initiated. contribute to the project in any other way. The farewell speech was very emotional; it was taken over by Prof. Maribel del Pozo Triviňio, PhD. in Translation and Interpretation. Professor showed her sensitive reaction to the “Jafar” film, which not only serves for linguistic purposes but also opens hearts and encourages to deep analysis of humanity. Consequently, the intercultural aspect of the HELP project and didactic materials gained a lot of recognition. The HELP team was congratulated on the project’s idea as well as on hard and creative work.